Do you want a record of Phoebe Smith that 'tells it (more or less) like it was' or one where she is uncharacteristically restrained and uncomfortable? A loaded, but it seems to me, perfectly reasonable question in the circumstances. There are tracks of Phoebe's singing on quite a few records, some showing her to full advantage, but the only Phoebe Smith album, 'Once I Had a True Love' recorded by Paul Carter in1970, is a travesty; in the notes to this new CD her son Manny says "... when she was recorded for the record they wanted her to sound like a folk singer, so her singing is subdued". Certainly, in the months after the release of this record she was very unhappy with the outcome, and told me "they kept telling me to do it again because I didn't do it the same as last time". 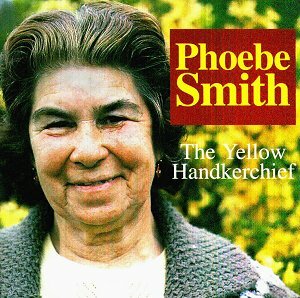 The Yellow Handkerchief is not the perfect recording, nor even the perfect representation of Phoebe Smith, but it is a damned good try. The opening track Raking the Hay is superb (sound clip) - Phoebe at her very best; it has been published before, on 'Travelling Songsters' but here the modern technology that goes to produce a CD (don't ask!) has improved the quality immeasurably. The same is true of all those previously used recordings from 'Travelling Songsters' and the stunning Barbara Allen from 'Songs of the Open Road', all recorded by Mike Yates in 1975-6. Though Veteran attributes the recordings to Topic not all are those used on the earlier records - The Sheepfold here is a more complete and even better performance; it's rather surprising that it was not the recording used on 'Travelling Songsters'. I do not possess a copy of the solo record, but I am sure that the halting A Blacksmith Courted Me cannot be the one which was used. Mike Yates, in his delightful notes, does say that some of the songs "...lay half buried in the depth of her memory... Others had to be coaxed, verse by verse, sometimes line by line..." The rendition of the Blacksmith here bears little relation to the splendid live performances which have so thrilled audiences, and I am sure that this was probably an early result of Paul Carter's journey into Phoebe's memory. There are some lovely surprises on the CD, such as Wings of a Swallow, obviously the remains of a one-time popular song, the performance of which reminds me of Phoebe singing Who's Sorry Now? to silence a piano accordeon one memorable New Year's Eve. Young Morgan with promptings from husband Joe is a taunting fragment of an old ballad, and the inclusion of Joe Smith singing Lavender is a happy indication of their long close life together. It will be quite a revelation for those who never saw Phoebe, to hear this other, less imposing side of her, as she probably sits on the sofa singing. I hope and believe it will be a pleasure equal to that which I felt when I heard Jane Turriff's 'Singin' is Ma Life' (Springthyme) which not only includes all the well known Turriff 'heavy weights', but also delightfully The Cobbler with (her own) accordeon and yodelling. We all know traditional singers sing all sorts of songs, but to have the evidence on record at last, is a very welcome recent phenomenon. The live recordings are delightful, though wrongly placed in 'The Fox'. The performances actually took place at the 'King's Head'. 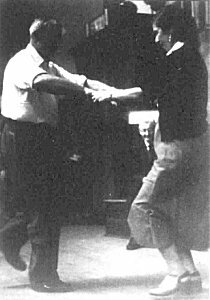 Martin Byrnes, who plays fiddle for Phoebe's stepping, often came to the club because he lived in the pub, just as we often went to the pub on non club nights when he played with Bobby Casey in the bar. Phoebe's two visits to the club, with husband Joe and eldest son Big Joe (both to be heard joining in on Yellow Handkerchief - sound clip), were truly nights to remember, and some of the lively good humour can be heard in these rather rough amateur recordings. Unfortunately, there is no example of Phoebe absolutely letting go, as she would do on occasion, but recording this type of performance acceptably is notoriously difficult. A stunning recording of Margaret Barry singing She Moved Through the Fair in 1958, has been considered unusable until now because of the overload and breaking up of sound. Although this is soon to be released on Topic's mammoth 'Songs of the People', I'm afraid those who never saw Phoebe Smith will probably not experience the full impact of this raw element of her style. All in all this CD is a delightful production - the lovely bright cover with the beautiful picture of Phoebe, the gorgeous photo on the back cover of Phoebe dancing with Bob Roberts at Cecil Sharp House, as I had seen them dancing at 'The Fox', some time before these recordings. There are some truly wonderful recordings by Mike Yates, not overloaded with what he calls 'old ground', and although there is plenty of the magnificent sombre performance for which she is best known, Veteran have not been afraid to use the the fairly rough, live recordings to give a rather broader picture of this most important of our living traditional singers. Phoebe still lives in Suffolk, but she long ago stopped singing for those outside her family - "you've had the best of me."